Are you a people pleaser or a people lover? Are you a God pleaser or a God lover? I may get some flak for saying this, but people pleasers are very self-centered individuals. When you run across those who simply cannot say no to anyone, do you think to yourself, “My, what a nice person.”? Unfortunately, most do. Or, what do you think of the person who can’t stand anyone to be mad at them? Do you automatically think, “Oh, they are such peace-loving people.”? Unfortunately, again, most do. If we cannot say no to people, we are in essence saying no to God. What if God did not want that for that person, or for us? We cannot please both man and God, can we? In our devotions this morning, the question was posed, “Is it better to please God or to trust God?” Now, obviously, by the way it is worded, anyone can figure out the correct answer is to trust. Yet, without the comparison of trust, most people with a works-based mentality will typically fall under the belief (of which I have had thrown at me way too many times) that as Christians we are to live to please God. We need to be good little boys and girls. On the surface, it sounds good. But God cares more about our hearts than our actions. Why do we please? Why do we behave properly? When we teach our toddler not to touch that hot stove, they will obey for fear of pain. Very rarely will you find a toddler who will leave hot appliances alone without instruction, especially boys! How many mothers can attest to the continual question, “But why? ?” Because I said so. 😉 1 John 4:18 says, “There is no fear in love, but perfect love casts out fear. For fear has to do with punishment, and whoever fears has not been perfected in love.” Oh, to come to the place where we long to do good out of love…not fear. We are carnal people. We are selfish people. Do we want God to be pleased with us for our own benefit? Or for His? Do we please (or go around doing “good” to others) out of fear of reprisals? We want our world to be soft. We want our “Brownie Points” as I used to tease my kids. We want to please others because it feels good…to us. 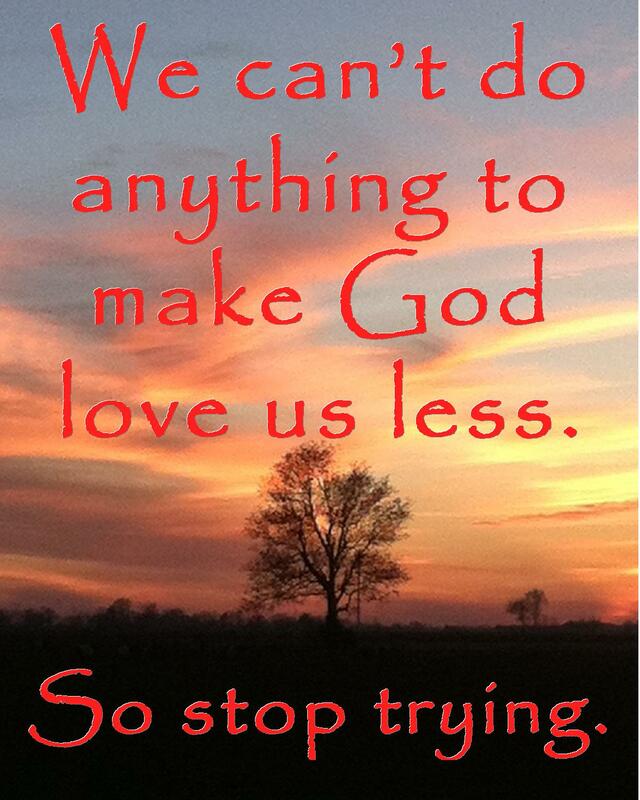 We want to please God because we are under the impression He will love us more. We want to please God because we are under the impression we will have greater reward in heaven one day. We want to please Mommy so we can have an extra helping of ice cream on top of those brownies! Are you following what I am saying yet? I believe it all boils down to the words of Jesus in Matthew 22:35-40 that we are to love God and Man. To Love. All the commandments are inconsequential after the command to love, for the rest will naturally fall into place. No, he loves…without expecting anything in return. He loves without expecting us to please him. He just loves. We are to love (do for) others as He loved us, without expectation. He says wait. He says yes. He says no. Although God wants good things for his children, he never tries to please us. He gives us that which is in our best interest. Giving us that which is not in our best interest is not love. Pleasing us for our happiness is not love. Giving us that which is in our best interest, even that with which we are not pleased is love. What is our motive behind pleasing others? Do we think God doesn’t know our motives behind our wanting to please Him? Contributing to the happiness of others in order to fluff our own happiness is not love. Contributing to the best interest of others for their sake, without expecting them to even so much as like us…is love. What does trusting God look like? Do we trust God for our best interest? Do we really believe he loves us? If we trust in His love, we won’t expect anything in return. We will know He has our back. We will not feel the need to please Him to be accepted. We will want to be the person he created. Typically, we want to be like those we love. We want to be like Jesus. Pleasure, pure pleasure, only comes when we fully trust in His love. This entry was posted in Devotions & Proverbs & Psalms, Forgiveness & Justice & Love and tagged brownie points, character, Christianity, God, God pleaser, inspiration, love, no fear in love, people pleasers, Relationships, self-centeredness, unconditional love. Bookmark the permalink.